The Monsoon has been quite generous to Kerala, Coastal & Interior Karnataka, and parts of TN & Rayalaseema in the recent days. Conditions are favourable for further track down of the monsoon towards south bidding adieu from north Arabian sea in next couple of days. The effect of the Trough over north kerala and UAC over north coastal AP that has been fetching isolated heavy rains over the peninsula is set to reduce. The prevailing winds that were quite unfavourable for North TN coast has improved and this could perhaps open a window for some Thundershowers in the next 24 hours. 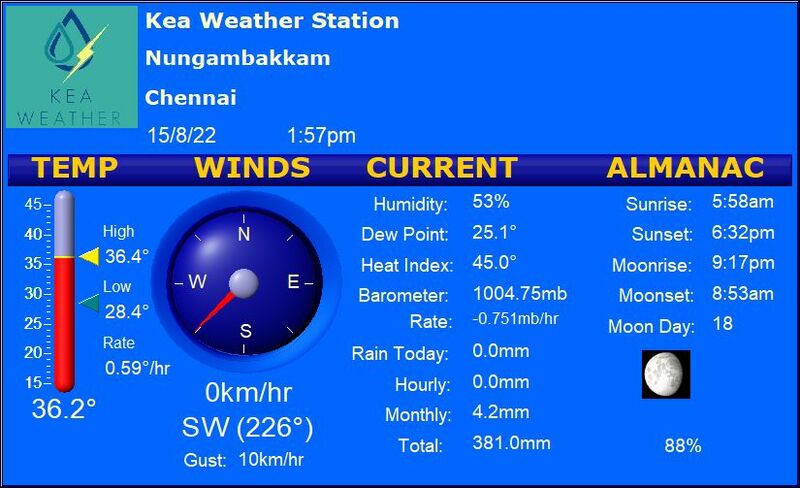 Chennai – Cloudy and humid with maximum temperature in the range of 34C. Chanced of Isolated thundershowers in the evening. Vellore – Partly cloudy and warm with maximum of about 34 C. Isolated showers are possible towards the evening. Trichy – Warm weather through the day with maximum of about 35C. A shower or two in spots. Madurai – Warm with a mix of cloud and Sun with max of 35C and followed by a cloudy evening. Coimbatore – Mostly cloudy with a day time maximum of 31C, followed by a cloudy night.